[Ship Victoria of Ferdinand Magellan] - MÜNSTER, S.
Title : [Ship Victoria of Ferdinand Magellan]. Size : 2.7 x 2.6 inches. / 6.9 x 6.5 cm. 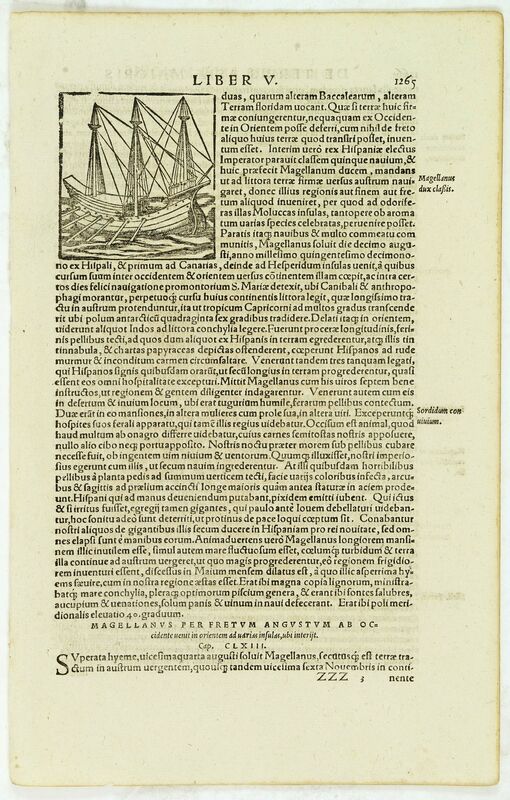 From a Latin text edition of his Geographia , that great compendium of Renaissance knowledge. One of the greatest explorers of the Age of Discovery, Ferdinand Magellan is best known for leading the first expedition to circumnavigate the globe, although he personally did not complete the route, perishing in the South Pacific. A determined man, he overcame personal obstacles, mutinies, uncharted seas and biting hunger and malnutrition during the course of his voyage. Today, his name is synonymous with discovery and exploration. Condition : Woodblock print with letter press. With large margins. Paper slightly browned as usual. Very good impression.